This brass plaque hangs on the wall in Washfield Church. 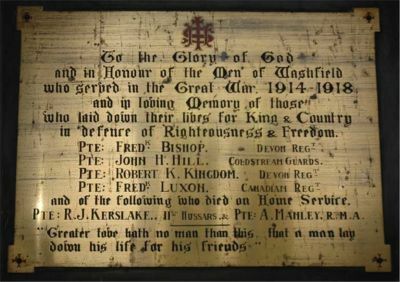 Private Fred Bishop of the 2nd Battalion, the Devonshire Regiment. Son of the late William and Sarah Bishop (née Stevens) of Ducksdale Cottage, Washfield.. Born in Cadeleigh in the March Quarter of 1890. Died 1 January 1915 aged 24. Guardsman John Harris Hill of the 1st Battalion, the Grenadier Guards. Son of John Bucknell and Elizabeth Hill (née Harris). Born in Washfield in the March Quarter of 1896. Died 11 March 1919 aged 23. Buried in St. Mary's churchyard at Washfield. Private Robert Kent Kingdom of the 16th (Royal Devon and Royal North Devon Yeomanry) Battalion, the Devonshire Regiment. Son of Robert and Mary Ann Kingdom (née Kent). Born in Stoodleigh in the September Quarter of 1896. Died 3 December 1917 aged 21. Private Fred Luxon of the 75th Battalion, the Central Ontario Regiment of the Canadian Infantry. Son of Richard and Amelia Luxon of Keeper's Cottage, Washfield. Born in Washfield in the June Quarter of 1893. Died 9 April 1917 aged 24. Private Reginald James Kerslake of the 11th Reserve Cavalry Regiment (the 11th Hussars). Son of William and Flora Kerslake. Born in Thelbridge in the September Quarter of 1895. Died 30 January 1915 aged 19. Buried in St. Mary's churchyard at Washfield. Not yet confirmed but believed to be Arthur Frederick Manley of the Royal Marine Artillery who was born in Loxbeare in the June Quarter of 1897. "GREATER LOVE HATH NO MAN THAN THIS . . .